A complete breakdown of every detail fans missed in 'GoT' Season 8 opener. 'Game of Thrones' Season 8, episode 1 image. - [HBO / YouTube screencap. After a 20-month hiatus, "Game of Thrones" is finally back with what's probably the best season premiere the show's had since the pilot. 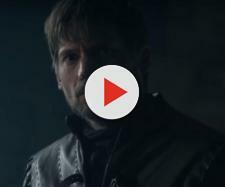 This episode, appropriately titled "Winterfell," was, as you might have guessed, all about the reunions and setting the stage for greater things to come. However, it also featured plenty of Easter eggs, hidden references, and callbacks to earlier seasons you easily could have missed on your first watch. So, without further ado, let's take a look at the most interesting details I found. Spoilers will follow. The blue tiles on the map represent the lands that the White Walkers have conquered. Last Hearth, the seat of House Umber, is the first castle South of the Wall to fall, as seen near the end of the episode. — Game of Thrones Season 8 theories (@GOTS8theories) 15. април 2019. This emblem depicts the last scene of "Game of Thrones" Season 7. You can see the Night King on Viserion as he breaches the Wall at Eastwatch with the Army of the Dead in the lower right corner, and Bran's ravens on the right. Ned Stark to Jon Snow in Season 1, episode 2: 'Next time we see each other, we'll talk about your mother'. Did Daenerys just doom herself in one sentence?